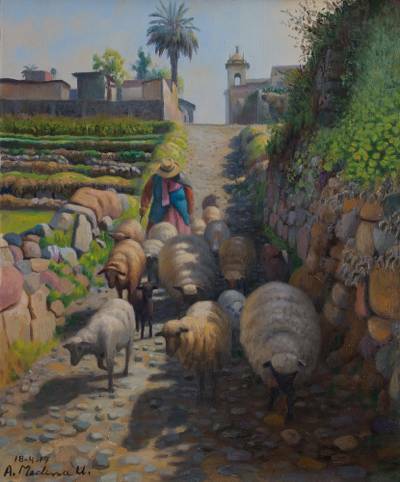 Signed Original Oil Painting of a Shepherdess in Paucarpata, "Sunny Day in the Andes"
Palm trees watch over an Andean village like sentinels on a sunny day. Earth colors dominate this lovely painting by Alcides Medina. He depicts a shepherdess who guides her flock down a cobblestone lane in Paucarpata, past strong stone walls built by hand.